I have been an educator for 18 years, working with students from the steppe of Kazakhstan to the bush villages of Alaska. Passionate about people, places and their cultures, I have taught Language Arts, Social Studies, Heath, Art, ELL, and even all subjects in the rural schools. While serving as a technology and effective instruction coach for my most recent school district, I was able to tap into and curate the myriad of solutions available in today's dynamic world. I now am applying the solutions to my work with my students as a Distance Learning teacher based in Seward, Alaska. Currently, my mission is to help facilitate the transition to Personalized Learning in my district. Responsibility, respect and integrity form the foundation of my teaching philosophy. 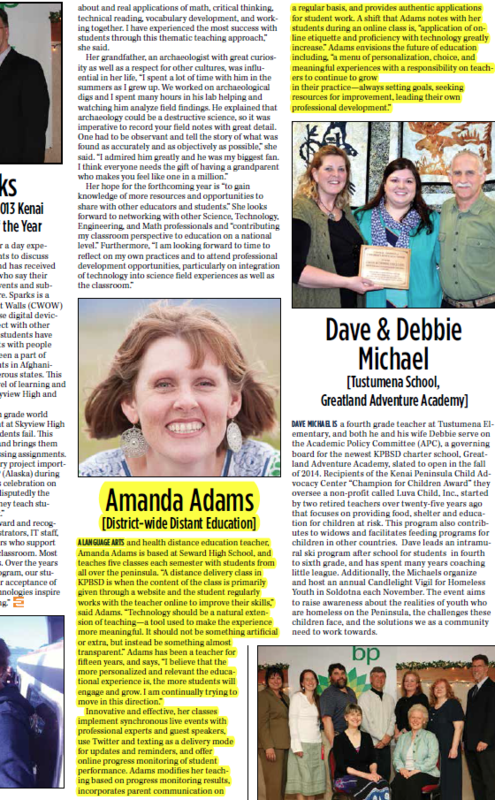 A little more about Amanda here! Dedicated to creating engaging, personalized, and authentic learning environments guiding students to take an active role in their education. Continuing to grow in my practice of teaching through service, collaboration, and personal growth.